In this post, we explain the legal situation for drone pilots in Botswana. In Botswana, some permits are needed to fly with a drone. So every copter has to be registered and then receives a certificate (with name, contact details, and address of the taxman). Foreigners need an import permit before entry with a copter to Botswana, which must be requested at least seven days before arrival. In the registration process, your person is checked with a background check, for which a certificate of good conduct must be submitted. The registration fee is 250 BWP (about 23 euros). Maximum Altitude: Drones must not rise higher than 120 meters (400 feet) in Botswana. Maximum horizontal distance and FPV: Drone flights in Botswana are only allowed within the direct range of sight, but not more than 500 meters away. If you use FPV equipment, you must have a visual observer (VO) at your side. Compulsory insurance: We recommend the use of drone liability insurance for flights in Botswana. Maximum take-off weight (MTOW): The maximum take-off weight of drones is 20 kilograms. Distance to airports: 3 kilometers. Other safety distances: 200 meters to power lines. Flight Bans: You are not allowed to fly in many areas (above wild animals, tourism facilities such as hotels, national parks, built-up areas, etc.) unless you have obtained specific permission. It is forbidden to fly over major roads, prisons, police stations, courts, accident sites, security facilities, government buildings, traffic, and military installations. Operating hours: Drones may only be flown in daylight. Special legislation: The operator of a drone must be at least 18 years old. Crossing the border is not permitted. Regulations for commercial pilots: Currently unknown. Good to know: The transfer (lending, sale or leasing) of a registered copter is only permitted with the consent of the authorities. 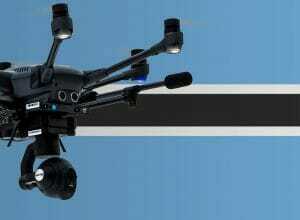 We have researched the listed drone regulations for Botswana to the best of our knowledge. We cannot guarantee the correctness of the information. If you want to be on the safe side, contact the competent aviation authority. Alternatively, you can also ask the embassy in your country for further information about the regulations. Please leave us a comment when you receive news and/or gain experience with your copter in Botswana! I am the executive producer of the TV series 50 BY 1 (50 POR 1) presented by Mr. Alvaro Garnero, the travel show is on air for its seventh season and it’s ​part of​ Spectacular Sunday (Domingo Espetacular), the most prestigious weekly electronic magazine on TV RECORD, the second largest network in Brazil. The show is also broadcasted around the world to over 150 countries through TV Record News, Record International and Europa News. ​Our goal is to capture a bit of culture, history, gastronomy, curiosities and the best each destination has to offer. It’s not exactly a show about tourism but about experiences where the presenter is the leading figure. Each program takes 12- 15 minutes and is shown in prime time – on Sunday around 8pm – reaching about 30 million viewers across the country each end week. The second largest audience rate in the country at its date and time.Therefore, we believe a lot in the return and result not only for the series but for our partners and destinations. We are goingo to Botswana on April 17, and I just figured out that I couldn’t use the drone. The use of the drone would be a huge gain, as we would be available to reveal the beauties of this place under a completely different and unusual perspective. Do you know any fast track we can use to get this drone license? Unfortunately, I have no idea how you could speed up the process of getting the license 🙁 Good Luck! Is this registration & permit also necessary for recreational use and were can we buy this drone registration & permit ? Doesn’t tell your story. How can one submit for this import license? I would hate to see my drone confiscated. You talk about a registration process, I have tried to sent an email but nobody reply. San I have the link you used or the email, please?